Lightspeed Systems’ K-12 Filtering/Monitoring Solution Relay Released for Mac OS, iOS and Windows - Lightspeed Systems, Inc.
Education technology company Lightspeed Systems announces the availability of its patent-pending Smart Agents for all operating systems, including Chrome OS. AUSTIN, TX. — Today, Lightspeed Systems announced the general release of its Smart Agents for Mac OS, iOS and Windows, bringing multi-OS support to its K-12 school filtering/monitoring solution, Relay. These revolutionary, patent-pending agents — which provide seamless SSL decryption and mobile filtering to student devices, and have previously supported just Chrome OS — are available to Relay customers now. 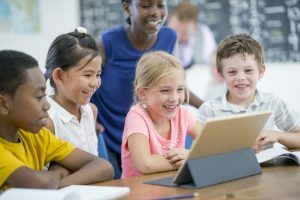 K-12 schools are implementing one-to-one programs in record numbers, and school IT departments are responsible for the daunting tasks of filtering students’ internet access on these devices as well as identifying suspicious online activity, locating lost devices and more. Complicating matters is the wide array of devices in individual schools and districts: tablets, laptops, desktops and smartphones, often on a variety of operating systems. • Classroom — Relay’s AI-powered classroom management solution, Classroom, is included free when customers license Relay.